Sleeping well is the basis for good health. Many people have trouble sleeping: they have trouble falling asleep or have sleeping disorders such as waking up at night. These problems with sleep all have different origins. The use of sleeping pills doesn’t deal with any of the causes and is only a temporary solution. One of the results of applying the MIR-Method is that sleep improves. To clarify how this is possible, it’s necessary to zoom in on one of the problems with sleep, in this case, difficulty falling asleep. Next week I will write about waking up at night. When you lay down, you are supposed to become drowsy and fall asleep within 10 minutes. Two things can cause trouble with falling asleep: there is a physical issue or (old) emotions are bothering you. Trouble falling asleep can have a physical origin. You may not have enough melatonin. Your body makes this sleep hormone when it is dark. If you have been sitting behind your computer or have been watching TV, your body doesn’t switch to sleeping mode. This is because the light that comes into your eyes via the screen causes your body to think it is still daytime. A bedroom that is not dark enough can also cause you to have more trouble falling asleep. Alcohol is a really bad night cap. You might fall asleep but will pay for it by sleeping restlessly or waking up in the middle of the night because of the various sugars in alcoholic drinks. If you take sleeping pills, you probably can’t sleep without them. However, you are not dealing with the real causes of your sleeping problems. My wish for you is that the MIR-Method helps you overcome the real source of your sleeping problems. I hope in the end that your physician can tell you that you can stop taking them. Emotions that still bother you can be a huge source of trouble falling asleep. These, often old, emotions can even hamper the production of melatonin. This was the case with a young woman whom I treated. She couldn’t fall asleep and suffered because of it. When we looked into it, we discovered through the use of muscle tests (Kinesiology) that she subconsciously wanted to prevent herself from falling asleep. This was because she had had such a hard time at school when she was 10 that she refused to fall asleep. “No new day, no school!” was her childlike reasoning. When she was able to let go of the old emotion, she was able to fall asleep again effortlessly. So sometimes it involves an emotional decision we made earlier in life which has an effect on our bodies. Anger and especially fear are emotions that prevent us from falling asleep. A 12 year old whom I treated woke up because his father was fighting with a burglar (it ended well!). Subconsciously, he remained worried that another burglar might come and couldn’t fall asleep. But an older brother’s pranks, which awake and scare you, or a pet that often jumps on your bed, can cause you to be overly alert. Therefore, when you go to bed, you can not relax enough to fall asleep. Step 3: Detach father. Detach mother. You can let go of your parents’ anger or rage that you have internalized. Step 4: Clear meridians. Fear works through the kidney meridian; for example, fear of something that will happen the next day and that you are reluctant about such as an exam or dentist appointment. Step 7: Fulfill basic needs. Needs such as safety, security and reassurance become replenished within you, causing you to feel more secure and more at peace. With Step 5: Supplement all shortages, you command yourself to supplement various nutrients and with that, hormones. The body creates hormones from the proteins we eat, so it’s possible that you will temporarily crave proteins. To make melatonin, the body needs serotonin and for that, the body needs tryptophan. This can be found in chickpeas, bananas, chocolate and milk, among other things. Don’t be surprised if you suddenly want to eat 3 bananas at once; your body may be trying to supplement a shortage of the sleep hormone! Steps 1, 2, 8 and 9 support the above-mentioned steps. Step 6: Balance hormone system, lastly, has a wonderful effect through the Hypothalamus. This is the gray lobe in the center of our brains that creates hormones. This lobe is responsible for our sleep and wake cycles. (Isn’t our body incredibly clever? As well as the scientists who discovered this!) When the function of the Hypothalamus is disturbed, our sleep and wake cycles becomes disrupted, as well as our internal heater and our feelings of hunger and thirst. Observe yourself to see if you recognize this. The Hypothalamus can become disturbed through unresolved emotions, which are generally coupled to issues with your mother. I discovered this in my practice while testing many clients. Other, more practical disturbances can also be the cause of poor sleep, such as having to get up at night to feed your newborn baby, or if you have just taken a long trip by plane and are dealing with jet-lag. 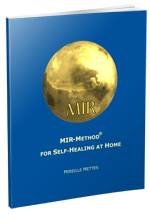 In short, I hope that you will give the MIR-Method a chance and that it can help you to once again fall asleep without any cares and that those problems with sleep become history! Sleep well, have good health! Has this article helped you? Do you recognize yourself in the examples? Let me know and write about it below! Also use for asking me questions about falling asleep. Thank you! Good luck and wishing you a good night’s sleep! P.S. You would do me a big favor by spreading the MIR-Method to others by posting this article to your Facebook page or forwarding it via e-mail, Twitter or Linked-In! Use the icons on the left-hand side or below! Thank you! The MIR method has helped me so much.I am so grateful for your beautiful work and simplicity of the MIR method. It gave me the boost to break out of codependancy and change many other bad habits. This article on sleep applies to me so much.Ive been unable to get to the root of the sleeplessness for many years, but now I’ll restart the MIR method for it and see how it goes.I am hopeful. Great to hear that from you, thank you! Would you like to share some of your ‘bad habits’ that have gone? When you think about the cause of sleeplessness, try to think about if something happened to you when you were a child. Maybe you were startled from something or someone. Maybe you were sleeping at your aunt’s and something happened. Soon as you realize, you can let it go by using the MIR-Method. Good luck!